Elko Speedway is happy to announce its newest corporate partner the New Prague Auto Group, the official vehicle supplier of Elko Speedway. The New Prague Auto Group will be supplying a new 2014 Mustang for the pace car and 2014 Chevrolet pickup to serve as the safety vehicle. The two-year deal will also feature signage at the track and a company outing for the dealership’s employees. With dealerships in New Prague, MN and Hudson, WI, the New Prague Auto Group is your source for Ford, Chevrolet, Chrysler, Jeep, Dodge and RAM cars and trucks. Mark Swelland, the owner of the New Prague Auto group, lives in nearby New Prague and is no stranger to Elko Speedway. He is an avid race fan who attends the races when possible. 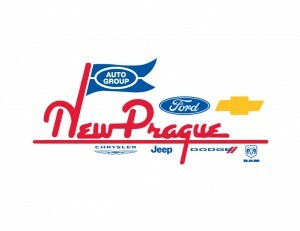 So please consider the New Prague Auto Group when it is your time for a new vehicle. And don’t forget to tell them you heard about them at the Elko Speedway.